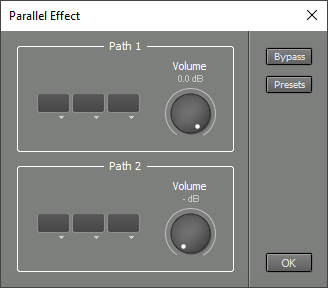 The Parallel Effect has two signal paths. Each path has its own effect slots. The outputs of the two paths are mixed using the Volume controls. The Parallel effect can be used to add effects. For example, echo can be added to a part of a track using an Echo and an Automated Fader effect in one of the paths. Another application is parallel compression, which is popular in classical music. By using a Compressor effect in one of the paths the dry and compressed signals can be mixed.